“Surprise in the Kitchen” by Mary Lee is the third installment to the Mia collection. Mia is a young girl that enjoys her mother’s cooking. One day, she decides to show her appreciation by surprising her mother by making breakfast. This is a fun and colorful book that young children will enjoy reading while learning new words. I feel this is a book that kindergarten and first grade teachers should have in their classroom. Plus, this book is a great challenge for young, new readers without being too difficult. This is the complete review as it appears at my blog dedicated to reading, writing (no 'rithmatic! ), movies, & TV. Blog reviews often contain links which are not reproduced here, nor will updates or modifications to the blog review be replicated here. Graphic and children's reviews on the blog typically feature two or three images from the book's interior, which are not reproduced here.Note that I don't really do stars. To me a book is either worth reading or it isn't. I can't rate it three-fifths worth reading! The only reason I've relented and started putting stars up there is to credit the good ones, which were being unfairly uncredited. So, all you'll ever see from me is a five-star or a one-star (since no stars isn't a rating, unfortunately).This is the third is a series of Mia books that I got as a single set. Two out of three isn't bad. This one was less appealing than the previous two. They're very much aimed at girls, and I wish they were a little more inclusive, but the story is about Mia, and her activities and passions, so that's the only perspective we get. That said, I did like the books in general terms. They were fun and feisty and interestingly drawn and plotted. The books are colorful and the other two told a real story. I imagine they would be quite engaging for all children, until the young boys start growing into other pursuits. This one was less than satisfying.Mia is a fun-loving and slightly accident-prone child who has a wild imagination and goes full-on into new adventures. In this one, she's invited to make cookies with mom. What bothered me about this one, having read three of them now, was that dad was not very involved in Mia's life. I got the impression that these stories were rooted in true life adventures, and that dad was out at work while mom was home (or out) with Mia during them. This is fine, but it would have been nice to have seen more variety in terms of parental interaction in Mia's stories even were it not there in real life for whatever reason. Mom even seems to sleep alone as judged by this particular story. Indeed, dad got only one mention in the entire three-book set, and that was very briefly in the first one I read. maybe they got divorced? !Mia isn't fond of baking, but she is fond of eating, so she feels rather like a spare wheel in the kitchen. She decides to make up for this by preparing breakfast for mom, and it turns into a predictable Mia-style disaster. It's nothing a nice plate of spaghetti can't cure, however. I can't recommend this story for the reasons I've mentioned, and because this one felt a lot less engaging than the previous two had. The cookie-baking was really not there - there was a start and an end but no middle (where we learn what went into the cookies), and I felt this was an omission that should have itself been omitted. Actually we didn't even really see Mia get to eat a cookie!This could have been used as a great teaching tool - to encourage children to seek advice from one parent when planning a surprise breakfast for the other, so it doesn't end up as too much of a surprise; to teach kids a bit about baking and kitchen safety; to show engagement with the dad in making the cookies. I think, as a recipe, it was lacking and needed healthier ingredients. But I wish Mia the best and hope her dreams and adventures continue! 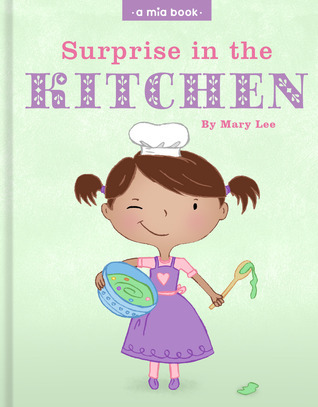 "Surprise in the Kitchen" by Mary Lee is a cute story for the very young. Mia's mother wants to know if Mia will help her bake cookies, but Mia much prefers eating cookies rather than baking them. In fact, Mia thinks her mother makes the best cookies around, but Mia just can't get herself excited about helping out in the kitchen. So the next morning Mia decides to make it up to her mother by making a special breakfast for her, without any help. Unfortunately she makes more of a mess than a breakfast. But her mother gives her a big hug and tells her thank you, even though the breakfast wasn't really very good.This little story has minimal text, and an abundance of colorful pictures. (There may be more text in this review than in the book.) There are 3 or 4 pages of pictures for every page with text on it, and even then the text is usually overlaid on another picture. This book could be drawn out to take a long time to read just by pointing out things to see in the pictures. Or, it could be read very quickly, due to the minimal amount of actual text. That second option makes it ideal for those bedtimes when the kids beg for "just one more story".The illustrations are nicely done, and are sure to hold the attention of your kids for as long as you want them to. I recommend this cute little story book for kids up to maybe first or second grade. It is a kids book that is done well. Cute little story. Beautiful illustrations. This could be a very interactive book that a child can relate to in several ways as caregivers take the time to talk about the different things depicted in the illustrations. Fun! We read this out in the hammock last night. Super cute little story. Even my son was enjoying it. Mary Lee does it again. We love her Mia series. My daughter loved reading about Mia's adventure in the kitchen to make a special breakfast for her mom. Mom bakes cookies for Mia but Mia does not like to cook. She decides to make breakfast for mom one morning. Nice story but could have been more descriptive. Good illustrations. MaryLee - I am a writer, illustrator, graphic designer and a mom. I've lived in various places across the country but currently my heart is in the Bay Area. I have two sweet children, two dogs and a mini-cactus named spike. In my free time (ha ha ha), I like to read books, jog slowly, cook badly and sleep rarely.